^ "World News Briefs; French Paper Apologizes For Slurs on Dreyfus". The New York Times. Reuters. January 13, 1998. Retrieved 25 March 2018. ^ Bridger, David; Wolk, Samuel (1976-01-01). The New Jewish Encyclopedia. Behrman House, Inc. p. 111. ISBN 978-0874411201. 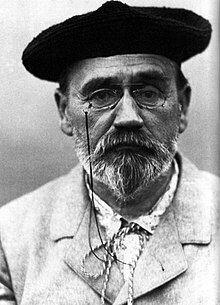 ^ "Thousands March at Funeral of Émile Zola: Municipal Guards Line the Route to Preserve Order". The New York Times. 6 October 1902. (Subscription required (help)). ^ a b Mounier-Kuhn, Angélique (August 8, 2014). 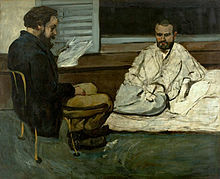 "L'asphyxie d'Émile Zola". Le Temps (in French). pp. 8–9. ^ Holden, Stephen (March 29, 2017). "Review: In 'Cézanne et Moi,' Zola and the Artist Are Pals. However ..." The New York Times. p. C8.